Selling your home is one of the biggest financial moves you will make in your lifetime. So, it only makes sense to have the best strategy. As a Realtor for 13 years, I have seen so many properties that do not attract a qualified buyer and go “stale” on the market. There are reasons for this. Below I’ll show you exactly what I will do to successfully sell your home for the most amount of money and in the shortest amount of time. Developing the right price from the beginning of the listing period is the number one factor that will effect how long your home sits on the market. The proper price attracts buyer’s agents to show your home, promotes offers by serious buyers, and complies with appraisal contingencies in the Purchase Agreement. 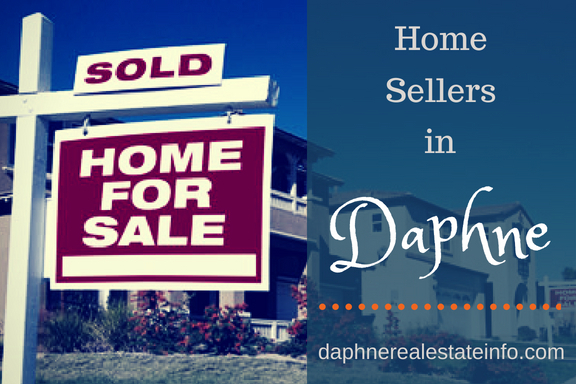 I have a keen sense of market conditions in Daphne by analyzing not only homes that are currently for sale but also homes that have recently sold, those that expired, and properties that were withdrawn. Location within Daphne is also something to take into consideration. For instance, homes that sell in Lake Forest have a much different sales price than those in Bellaton. With 96% of home buyers searching for their next home online, it’s crucial to showcase your property at it’s best. With 13 years experience of walking through 10’s of thousands of homes, I can help you stage your home to attract the most buyers. I know the mind of the buyer. It’s also very important to have quality pictures of your property and a lot of them. I can’t tell you how many times I look at listings with only 3 or 4 horrible pictures. It’s terrible and buyers are making decisions about your home without even seeing it in person. I always like to take at least 25 high quality pictures of the home I list in the best light. Quality photography and staging along with proper pricing will surely sell your home for top dollar and in the shortest amount of time. Gone are the days when you can just put a sign in the front yard and you’ll have 4 offers by dinner time. The evolution of technology is forcing Realtors to stay up with the times or they just get left behind. Personally I feel that agents are doing their sellers a disservice if they do not have a strong web presence through their own websites and social media. I have a total of 7 personal real estate websites. One of which, LiveGulfShoresLocal.com, is one of the largest and most visited sites in Baldwin County. Your property will not only be featured on all of these websites but also syndicated on dozens of major national websites. Your property will literally be promoted everywhere. Social media also plays a big part in promoting properties these days and your home will be constantly be featured on Facebook, Pinterest, Instagram, Twitter, LinkedIn, and Google+. High quality, color brochures and flyers will be created to give to potential buyers who tour your home. I also like to provide information about local schools and the community that are in the vicinity of the home. Of course if my client wants me to hold an Open House, I’ll do it. However, real estate marketing has evolved over the years and most Realtors around the country would agree that Open Houses really don’t work anymore. For the most part, real estate today is found online which is why you need an agent who is internet savvy. The key factor in selling your home fast and for the most money is exposure. My goal is to get your listing to the most amount of qualified buyers possible. Well, I’ll do everything in my power to give you the best advice and provide the services outlined above but I’ll even take it a step further. With my Easy Exit Listing Agreement you can leave our agreement to sell your home at any time if you feel that I’m not doing a good job for you. Although I don’t think anyone could market your home better, you do have that option. 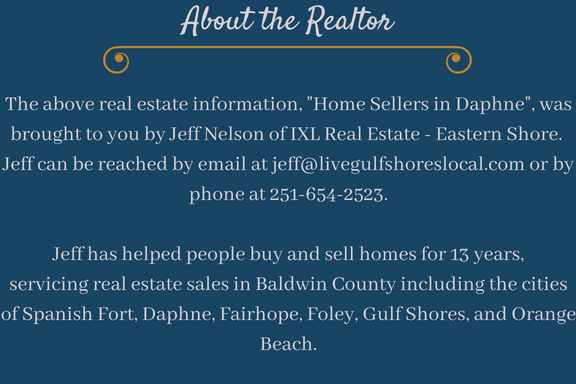 Thinking about selling your home in Daphne? Please contact me for a no obligation and zero pressure conversation about your needs and your home. I would love to give you my opinion on what it would take to sell your home for the best profit, shortest time, and least hassle.